Wondering how to keep your mind sharp as you age? Research encourages you to keep the brain busy! Researchers of a study published in the Frontiers in Aging Neuroscience hypothesized that a busy schedule would be a proxy for an engaged lifestyle and would facilitate cognition. Did it serve to be true? The results are in: The busier, the better! After examining the relationship between busyness and cognition in 330 adults aged 50 to 89, results revealed that greater busyness was associated with better processing speed, working memory, reasoning, and crystallized knowledge. There was also a particularly strong association between a busy daily lifestyle and an improved episodic memory, or the ability to remember specific events in the past. Researchers still wonder whether or not the busyness directly improves cognition, or rather is the byproduct of seeking out more learning opportunities and being exposed to more information. Stimulating the mind with various activities increases the creation of dendritic branches, which are the fibers on nerve cells that increase surface area to receive incoming information. So the more dendritic branches, the greater the surface area to process information and improve cognition and memory. Mental stimulation has further shown to delay the onset of cognitive impairment and dementia. Partake in at least 30 minutes of mind-stimulating activities daily, including reading a book aloud or to yourself, piecing together a puzzle with others, learning to play an instrument, working on crossword puzzles while eating a snack, building something with instructions, and baking with loved ones. Keeping active with exercise supports a strong body and brain in bountiful ways. Furthermore, exercise lessens feelings of stress and anxiety and improves mood and sleep. Exercise has even shown to improve both memory and thinking, flagging itself as a viable means to protect against dementia. Meditation is a method of transforming the mind by enveloping in a mental state of rest and consciousness. The practice has proven to enhance nine key brain regions to make us feel connected, boost creativity and brain power, increase emotional intelligence, subside depression, build memories, increase focus, and just down right make us smarter, happier, healthier beings. Whereas food is well-known to nourish the body, it also fuels the brain! According to the American Stroke Association, so-called “brain foods” include fruits, vegetables, whole grains, fat-free and low-fat dairy products, beans, and fish, especially varieties rich in omega-3 fatty acids, including salmon, tuna, mackerel, and trout. 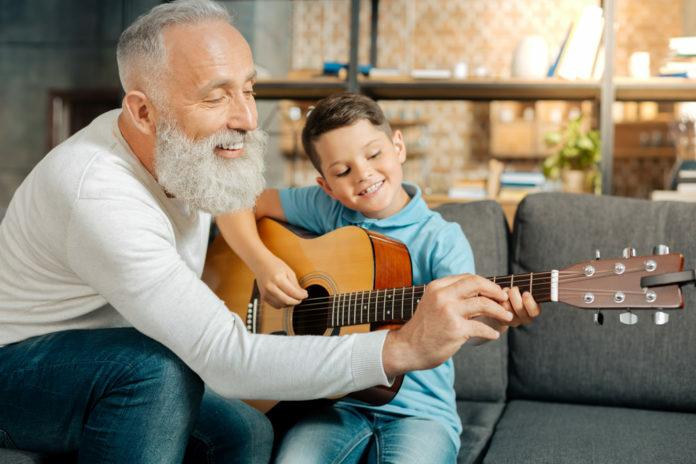 Listening and playing music has shown to ward off the effects of an aging brain by increasing a multitude of cognitive processes, including memory and concentration. Music also proves to improve sleep, reduce stress, spark creativity, and embolden feelings of happiness, excitement, and joy. Research has also implied you can dance your way to a healthier brain, showing to improve cognitive performance and reaction times, touting the practice as an effective treatment option for a number of conditions, including depression and Parkinson’s disease! Sleep plays an integral part of mental health, as the the restorative and rejuvenating advances of sleep is necessary for sharpening cognition. During sleep, nerve cells are actively communicating with one another and harmful toxins related to Alzheimer’s disease are being cleared. And without it, there is an increased risk of cognitive decline and overall greater likelihood of early dementia onset. Like young adults, seniors are encouraged to sleep seven to nine hours nightly, though good sleep gets tougher with age. So if struggling to achieve the recommended hours regularly, these ideas to help cure insomnia can help promote a better night’s rest. Make the most of your time with meaningful activities, as life should be filled with moments you will cherish the most! For instance, if you love to cook, invite grandchildren over to prepare a meal together. Also as a caregiver, help keep seniors busy and active by scheduling weekly outings and activities, accommodating mobility needs, exploring adult day programs, considering a pet, harping on hobbies, and utilizing technology.